Thank you for your work as a Red Cross face to face fundraiser. Together, we raise millions of dollars for New Zealand Red Cross every year, and we couldn't do this without you. This page is a great way for us to share information on what Red Cross is working on, and address some FAQs you may get asked while out on the street. Thanks for helping support our work as a face to face fundraiser. New Zealand Red Cross welcomes today’s announcement of Invercargill as the new refugee resettlement location. We’ve launched an appeal for people affected by the Bay of Plenty floods. Thousands of people have been evacuated in the region after the tail-end of ex-cyclone Debbie swept across the North Island last week, causing widespread flooding. Red Cross has been on the ground responding and will continue to do so this week. Most residents won’t be able to return home for at least 10 days with a significant number of them never being able to return to their homes due to the damage. People can support Red Cross’ response efforts to the flooding and the recovery of affected communities by donating to our Bay of Plenty Floods Appeal. The local Humanitarian Services Manager Jen Richardson, who has been helping with the response in Whakatane, says the damage across the region, especially in the town of Edgecumbe, is severe. Red Cross Disaster Welfare and Support Teams have been on the ground in Whakatane and Kawerau, assisting in Civil Defence centres and supporting people evacuated from their homes. The first person to email Hamish.Bell@redcross.org.nz with the name of the ex-cyclone that caused the damage will win $50 in cash. In response to the 7.8 magnitude earthquake that struck near Hamner Springs last week, New Zealand Red Cross has activated an emergency operations centre in Christchurch to coordinate the response across the South Island. All funds will be directed to help affected people recover from the disaster. Red Cross is working to assess needs to ensure funds are sent as quickly as possible to those impacted. More than 100 Red Cross field personnel have responded on the ground so far and 50 are currently on the ground assisting those affected by the earthquake. A Red Cross water and sanitation specialist is in Kaikoura and is delivering public health information to the local community including advising that there should be no showers, people should minimise the use of water, no waste water should go down any drains and people should boil or chlorinate water for consumption. At a rural community centre at Kaikoura Suburban School, about ten minutes north of the township, Red Cross has set up an emergency air shelter tent, and will provide the centre with water, food and other essentials, as well as daily information updates, to support the rural community. With the assistance of the air force, Red Cross has positioned water bladders and tap stands, emergency generators, satellite communications and an Air Shelter inflatable tent and lighting kit in Kaikoura. The New Zealand Red Cross National Office in Wellington was evacuated due to the danger of a neighbouring building collapsing. Staff are working from a temporary premises in the central city. Other buildings owned by Red Cross across affected areas are being assessed where needed. Red Cross has activated its Business Continuity Plan and will move to alternative offices where required. While still very much in the response phase, New Zealand Red Cross has already started early recovery planning, based on lessons learned after the 2011 Christchurch earthquake. About 50 New Zealand Red Cross personnel are on the ground in Marlborough and Kaikoura providing support to communities affected by this week’s earthquake. Red Cross is running welfare centres in Ward and Kaikoura to support people affected by the earthquakes. Another centre is operating in Woodend, Christchurch, for people who have been evacuated.In Kaikoura, Red Cross is operating the welfare centre in Kaikoura. We also used Defence Force helicopters to bring in emergency generators, satellite communications, an inflatable Air Shelter welfare tent and lighting kit, as well as water bladders and tap stands. In Marlborough, Red Cross teams are going door-to-door, providing psychological support to help people deal with the emotional impacts of the quakes.Red Cross teams have also provided support for people stranded by flooding in Wellington. Project Partners funding goes to where the need is greatest and not specifically to support this earthquake work. Project Partners cannot divert their donations to this either. However, their support is making sure we are prepared and ready to respond to disasters (along with our other programmes, which still need funding even while the focus is on the EQs). People wanting to help can donate to Red Cross’ November Earthquake 2016 appeal, which will support the emergency response and help affected communities recover. 100% of donations will go directly to the people affected by the disaster – Red Cross takes no admin costs. Text REDCROSS to 3281 to make an instant $3 donation. A great, fun and rewarding way to help is by fundraising for the appeal. From a morning tea in your office, to a mufti day at school or a donation box on your counter, find out some practical ways you can make a difference: https://www.redcross.org.nz/get-involved/fundraise-help-others/fundraise-november-2016-earthquake-appeal/. Red Cross staff based at the national headquarters on Molesworth Street, Wellington, evacuated their building following concerns about the structural safety of a nearby office building. Staff are currently working from home and at shared spaces, while temporary arrangements are being made. Please ensure that you follow us on Facebook for regular updates www.facebook.com/NewZealandRedCross and visit www.redcross.org.nz – information is posted regularly. Due to the earthquake and the evacuation of the Red Cross National Office, we are working in challenging and busy circumstances, please expect a delay to non-urgent enquiries. Our teams have been working since the initial quake hit in the early hours of Monday morning to help those affected. Water has been identified as a potential urgent need, so Red Cross has offered water bladders and tap stands for distribution to address this need. Red Cross has also sent Disaster Welfare and Support Teams to Marlborough and into Kaikoura on one of the first civilian flights into the town to support the worst-affected communities. These teams have set up welfare centres in Ward and Kaikoura and supported more than 100 people in these centres overnight. Red Cross is also operating a welfare centre in Woodend, supporting people evacuated from Kaikoura. Our Christchurch Disaster Welfare and Support Truck is situated here. Today, Red Cross teams will continue visiting households in the affected communities, assessing what people need most and providing psychological support, and more teams are en route with further supplies. We have also launched an appeal - the November Earthquake Appeal 2016. 100 per cent of donations will go to the emergency response on the ground in Marlborough and Kaikoura and to helping those affected by the earthquakes recover. The money will assist NZRC to respond and support affected communities. Our specially trained emergency response teams are on the ground right now assessing the situation and responding to the needs of the affected communities, through distributing water taps and tarpaulins. They’re currently helping out in Kaikoura, Marlborough and in Christchurch, including operating welfare centres and going door-to-door to provide psychological support and assess needs. Once other needs become clearer we’ll be able to plan our approach which may include cash grants and helping people recover through wellbeing programmes. We can guarantee that the money raised will help us respond to the disaster and go to the affected families. As with all our special appeals, 100 Percent of every donation will go to the emergency response and to helping affected communities recover. For example, none of the money raised will go to administration costs. As we saw with Christchurch, recovery from a disaster like this can take many years and we want to ensure we get our response right. Can I become a DWST member or assist in other Red Cross activities? Our Disaster Welfare and Support Teams are made up of highly-trained volunteers. They’re currently helping out in Kaikoura, Marlborough and in Christchurch, operating welfare centres and going door-to-door to provide psychological support and assess needs. However, as all our volunteers have to complete training before they are deployed, they will not be able to help at this stage. How can we reach people in need, in the area, who we know (family members/friends)? We can pass on names of people who need a visit to the EOC operation . eocs2@redcross.org.nz or 027 689 1268 and we can give out those details. It is also worth noting, the DWST member working in the affected community, conducting outreach and other tasks are to trained identify urgent needs and where to refer people to obtain any assistance they can’t provide. For those concerned about loved ones in affected areas: communications infrastructure is currently limited and we understand telecommunication providers are working to fix this. If you have family overseas who might be worried about your wellbeing it is good to let them know you are safe and well! 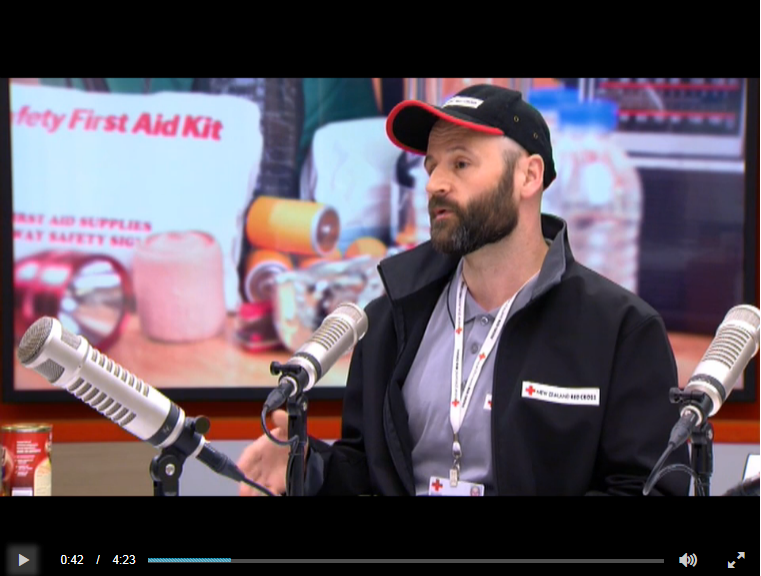 This morning on the Paul Henry Show Mark Rosny from New Zealand Red Cross was interviewed about to include in your emergency survival kit. On Friday 26 August, an appeal was opened online for the Italian Earthquake. 100% of donations received for the Italian Earthquake appeal will go to helping the Italian Red Cross with the recovery effort. People can make a single, one-off, donation to the Italian Earthquake appeal on our website. People are unable to direct their monthly Project Partner donation to this appeal, as those donations go to where the need is greatest. Italian Red Cross are responding with search and rescue teams, ambulances, and supporting survivors. New Zealand Red Cross has not opened an emergency appeal for this disaster and do not yet know if we will. Without an emergency appeal we cannot direct any donated funds to Italy. We only open emergency appeals when the National Society in the affected country asks for help, and if there is enough support from the NZ public for the cause. People can donate to the New Zealand Red Cross Global Disaster Fund which is used to help in situations like this, if help is requested by the National Society in the affected country. We cannot guarantee that the money will go to Italy, but it will be used for global disasters (beyond the Pacific region). The donor will receive a tax deductible receipt from New Zealand Red Cross for their donation. There is not an option to donate to this online, but a variety of alternate payment options are described here https://www.redcross.org.nz/get-involved/support-people-need/payment-options/. This applies only to one-off donations. Project Partners cannot specifically direct their support to the global disaster fund. If people want to donate specifically to Italy they can donate directly to Italian Red Cross through Ammado here https://www.ammado.com/nonprofit/cri However, they will not be able to claim the tax back on their donation. This media advisory is from the IFRC (International Federation of Red Cross and Red Crescent Societies). Please note the response to this earthquake is being managed by the Italian Red Cross. Rome/Geneva, 24 August 2016: Search and rescue teams and sniffer dogs from the Italian Red Cross are on the ground following a 6.2 magnitude earthquake in the early hours of the morning today. The towns of Amatrice, Accumoli and Arquata del Tronto village in central Italy are the worst affected areas. The Red Cross has also sent 20 ambulances to the affected areas, while local volunteers are on the ground providing support for survivors. Italian Red Cross spokesman Tommaso Della Longa said: “The pictures that we have received from our colleagues in Amatrice are telling us a terrible story of a town almost completely destroyed. Mobile kitchens are also being set up for people who have been forced to leave their homes. A 24-hour emergency control centre has been activated in Rome, while the Red Cross is also working from a mobile operations centre in the quake zone. New Zealand Red Cross says Government’s decision to increase the refugee quota is a step in the right direction, but more needs to be done. 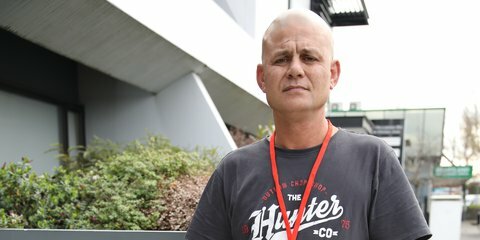 ​Tony Paine, New Zealand Red Cross Secretary General, says the increase will save and change the lives of people who desperately need our help, but given the current humanitarian crisis and the outpouring of support from New Zealanders he is surprised that we are not doing more. "The increase in the quota means 250 more people who face daily risks of violence, starvation, forced migration and who have no access to basic essentials like health care or education will find safety at home in New Zealand. "In the last year we have been overwhelmed by the generosity of Kiwis wanting to help. We now have waiting lists for people wanting to volunteer and our offices are filled with donated items for new arrivals. "Employers are reaching out to us realising the incredible contribution people from refugee backgrounds bring. Right now more than 1,100 people from refugee backgrounds in our employment programme are enrolled in study, in work experience or are in jobs. "All of this suggests that we have what it takes to do more, to save even more lives. "Today, our focus is on the people we will be welcoming into the community at the end of this week, as we do every two months. We are busy turning houses into homes, looking forward to offering former refugees a true kiwi welcome," Mr Paine says. New Zealand Red Cross is the primary provider of community refugee resettlement services in Aotearoa. After spending six weeks at the Mangere Refugee Resettlement Centre, people are supported in the community for up to 12 months by Red Cross. Resettlement is a life-changing and challenging experience. Refugees arrive in a country where the society, language and culture are often completely different from their own. Red Cross staff and volunteers provide a community orientation, helping to understand Kiwi culture and navigate systems, and connecting people to services they require. 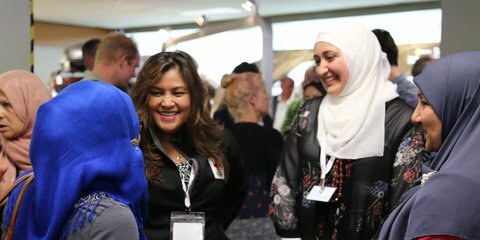 Red Cross also provides an employment programme to help people from refugee backgrounds plan their employment, training and career goals and ultimately find work in New Zealand. Employment helps people feel empowered and more involved in their new community. The resettlement programme currently operates in Auckland, Hamilton, Palmerston North, greater Wellington, Nelson and Dunedin. • Donate small household goods (not furniture, but items like bedding and things for setting up kitchens) that will help turn houses into homes for families resettling in New Zealand. Donations of goods can be made at any New Zealand Red Cross Shop or service centre. • Give someone from a refugee background a job, a key part of the resettlement process, through the Red Cross's Pathways to Employment programme. As Meals on Wheels has been in the news recently, we have been asked a few questions about our role in the service, the information below explains how it works and what we do. Our Meals on Wheels service supports the elderly and people with illnesses or disabilities living at home who would otherwise struggle to provide healthy meals for themselves. Our friendly volunteers deliver hot meals in communities throughout New Zealand. All District Health Boards (DHBs) in New Zealand are required to provide nutritional support to the community, by providing low-cost, home-delivered meals to those who need support. District Health Boards are responsible for sourcing the meals. Our role is to coordinate our Red Cross volunteers to deliver the meals throughout the community. To raise any concerns about quality of the meals, please contact your local District Health Board. How do I get meals delivered to me or someone I know? All referrals for this service must be made through the hospital or District Health Board. Phone your GP to see if you’re eligible to receive Meals on Wheels. Why does Red Cross deliver Meals on Wheels? Meals on Wheels is one of Red Cross’ longest-standing and most recognised services in New Zealand. We’ve been delivering Meals on Wheels since 1951. Meals on Wheels is not just about the food. It’s also an opportunity for people who may be isolated or elderly to form regular social connections. When our volunteers pop in with meals, they take the time to have a friendly chat and catch up. How do I volunteer to deliver Meals on Wheels? Volunteering is a fun, rewarding experience. You can sign up to become a volunteer on our website. You can also get in touch with your local branch or service centre to find out more. You may be asked about how Red Cross is responding to the developing humanitarian situation in Madaya, Syria. The International Committee of Red Cross (ICRC) has received authorisation from the Syrian Government to bring aid into Madaya, Foua and Kefraya. We were able to visit Madaya last October. There, our team was met with a dire situation. There were 40,000 people living there, with barely any food, water, electricity, medicine or access to medical care. We saw pure hunger and despair in people’s eyes. We saw mothers not able to breastfeed their newborns because they lacked adequate food for themselves to produce milk. Back then, we provided two months’ worth of medicine and other medical supplies, while the Syrian Arab Red Crescent and the UN provided food, also for two months. We have had no access to Madaya since then. We have been extremely concerned at the reports and photos that have emerged from Madaya in recent days. showing malnourished people or stating that people are dying from famine. However, But having not been able to enter since October, we cannot confirm directly that people are dying from starvation. Logically though, the population was desperate then and can only be more desperate now, having received no aid for months. We are extremely worried for people in Madaya. We also shouldn’t forget that the people in Madaya make up only a fraction of the half a million people living in besieged or otherwise hard-to-reach areas in Syria. Our priority together with SARC is to bring in assistance to Madaya, Zabadani, Foua and Kefraya, all of which are besieged, as soon as possible to avert worsening of an already dire humanitarian situation. The Syrian conflict is 5 years old. The economy has collapsed, essential infrastructure like water and power networks are hanging by a thread. And on top of that winter is upon us – and it’s very cold. We saw people burning garbbage and plastic for heat- which is very toxic for health. People are on their knees. 12 mio inside Syria are in dire need for help and more than 8 mio internally displaced. Relief supplies and equipment are already in place in vulnerable areas where locals, who are the first responders in any crisis, are trained to use them. Scientists are forecasting between 11 and 13 tropical cyclones to form, with four predicted to reach Category 4 or 5.